Let Hemp Seed artisan, handmade soap help you to ease life’s little bumps and take pleasure in its offerings. This soap is rich and green with lots of little creamy bubbles. Hemp Seed Artisan, Handmade Soap has a woody, pungent scent, just like true hemp. 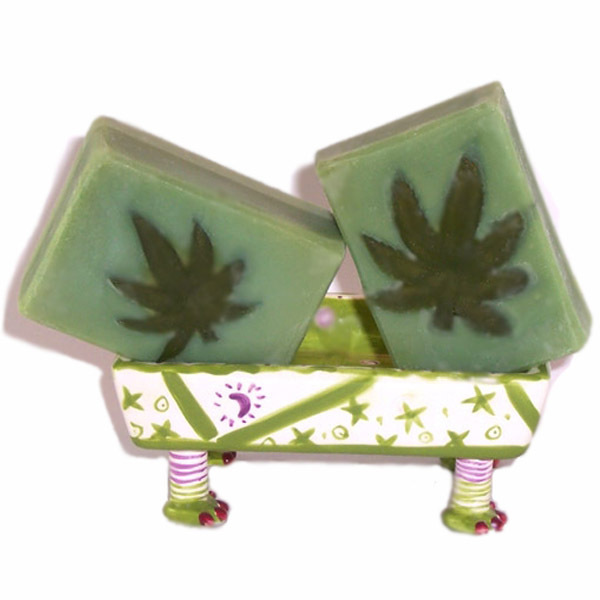 This is a unique soap with an embedded glycerin soap hemp leaf in every bar. The rest of the bar is pure, cold process soap. If you like the way natural unrefined organic hemp smells, you will love this handcrafted soap. My soap batches are made with natural olive oil, coconut, castor and beeswax. It has been enriched with pure hemp seed oil and natural mango butter. Hemp seed oil has essential amino and fatty acids, beta carotene and is almost identical to our own skin lipids. It is the only plant that contains natural vitamin D. Hemp seed oil has been used for thousands of years, making it an ideal ingredient for soap, skin care and body care like lotions and creams. It is a wonderful dark green color with natural antioxidants. This soap batch has been cured for over six weeks, to make sure that each bar is gentle and mild. Water that is used to make this cold process soap evaporates, leaving a wonderful soap that’s suitable for any type of skin. Ingr: Olive oil, Coconut, Palm Kernel, Mango Butter, Castor oil, Soybean, Sodium Hydroxide, Beeswax, Hemp Seed Oil, Sodium Lactate, Fragrance, Green Clay, Green Clay from the Coso Mountain region in California; may contain green oxide. Each bar is unique and embedded with a hemp leaf made out of glycerin soap.